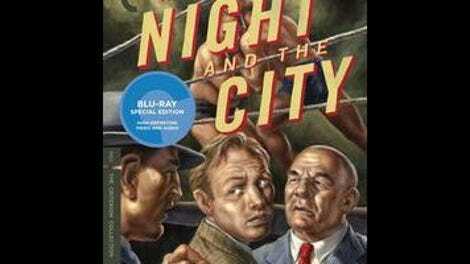 No classic film noir sports a more quintessentially noir-ish title than Night And The City. Kiss Me Deadly admittedly comes pretty close, as does Shadow Of A Doubt, but Jules Dassin’s 1950 film truly conjures up the entire genre with just those four simple words—even though it’s adapted from a novel (by Gerald Kersh) published in 1938, almost a decade before the term film noir was coined. Ironically, however, Night And The City is in many respects an atypical noir. For one thing, it’s set in London (like the book), despite having an American protagonist. For another, its main femme could scarcely be less fatale (though there is a secondary female character who qualifies). And while numerous noir boxing movies had been released in the preceding few years—Body And Soul (1947), Champion (1949), The Set-Up (also ’49)—this film focuses instead on the considerably less iconic world of professional wrestling. It’s such an offbeat milieu that the 1992 remake, which stars Robert De Niro and Jessica Lange, actually is a boxing movie, which is just one of the reasons why it’s so comparatively bland (see also: “Directed by Irwin Winkler”). Dassin’s original version certainly doesn’t lack for flavor (or “flavour,” as the movie’s many Brits would have it). First seen running frantically through the streets, pursued by an unknown assailant, Harry Fabian (Richard Widmark) is an expatriate hustler forever in search of the next get-rich-quick scheme. After failing to persuade his girlfriend, Mary (Gene Tierney), to invest in his latest venture—asking for her help only after his attempt to rob her fails—Harry stumbles onto another opportunity when he witnesses a rift between wrestling promoter Kristo (Herbert Lom, who would go on to play Inspector Dreyfus in the Pink Panther franchise) and Kristo’s father, the retired legendary wrestler Gregorius (played by retired legendary wrestler Stanislaus Zbyszko). Pretending to side with Gregorius and taking on the wrestler’s protégé, Nikolas (Ken Richmond), Harry sets himself up as a promoter, though he lacks the necessary cash to pay the venue where his first big match will take place. To obtain it, he swindles the wife (Googie Withers) of a local nightclub owner (Francis L. Sullivan), who swindles her own husband in turn. That’s a lot of shady transactions for one movie, and it’s not even the full list. This being a film noir, things don’t go well. Dassin’s approach to this material is more dramatically pungent than is customary for the genre, and less rooted in German Expressionism. 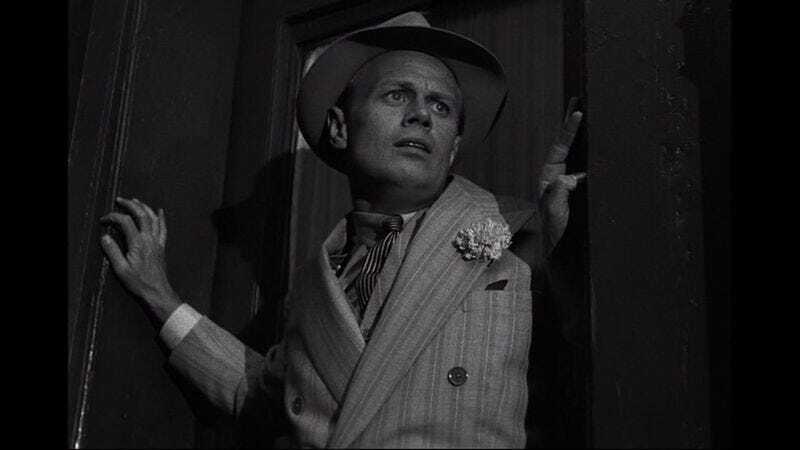 Imposing shadows are kept to a minimum, and Widmark makes Harry a sweaty, grasping loser, rather than the sort of cool customer exemplified by the likes of Humphrey Bogart or Robert Mitchum. He seems to be forever trapped in a metaphorical headlock, straining to free himself; it’s appropriate that the big match, when it finally happens (not at all as planned), is ungainly and brutal, worlds away from the fancy footwork of the boxing ring. Tierney isn’t given much to do other than representing the goodness that Harry’s desperation keeps pushing aside, but her character serves as a welcome counterbalance to Withers’ all-business Helen, who clearly married for money and can’t wait to ditch the fat old man who adores her. Even designated bad guy Kristo has a softer side, as his primary concern at one point is ensuring that his father, who remains loyal to the Greco-Roman wrestling style that’s no longer in fashion, doesn’t have his idealistic principles trashed by the unscrupulous Harry. Actually, Night And The City’s degree of cynicism depends to a large degree upon which version you watch. Criterion’s new Blu-ray upgrade of the film, which ports over all of the bonus features from their 2005 DVD, also has enough room to add the complete U.K. cut, which runs six minutes longer and features a different beginning and ending—Harry isn’t introduced trying to rob his girlfriend in the British version, and the finale is given a more romantic spin. (Dassin declared the American version closer to his intention.) The two cuts also feature entirely different scores, with the U.S. version composed by Franz Waxman and the U.K. version by Benjamin Frankel. Even if you don’t want to watch both from start to finish, be sure to at least check out the video essay comparing the two, which really drives home the crucial difference that music, or the lack thereof, can make. Waxman’s frantic score is often more effective than Frankel’s subdued cues; on the other hand, Frankel opts to let a major chase sequence near the end unfold without any music at all, and the silence proves more suspenseful than Waxman’s strings. It makes for radically different viewing experiences, even as both the night and the city remain constants.